I went out tonight for a short hunt, and checked out three promising sports areas which all turned out to be in use. It was a great night with low humidity and temps in the high 70's, so it was not too surprising that basketball was being played. After checking them all out, time was pretty limited so I decided to do my “experiment” and see what I would find at one of the grassy parking meters if I removed all the zinc and low conductor targets around it. This is something that I’ve planned to do for the entire lot, but it’s very time consuming and I hate zinc, so I’ve put it off. It was the right time and very educational for me. The parking meter space I picked at random was approximately 3' by 3' with a meter head set in concrete about 1' x 1' surrounded by sod. The ground is very light sand with some gravel mixed in, and since it is dry, I cannot plug. Everything was by probe locate and retrieval. I first went over the area slowly and carefully with the 5" coil, to see if I could locate any high tone signals, and managed to find three copper cents. Everything left was reading as zinc in the 50's and low 60's on the f75 meter. Most signals could not be separated one from another due to the close proximity of the coins. I started by using the pin-pointer to locate shallow targets and removed all the coins less than two inches down, using the screwdriver and my finger to pull them out of the ground. Then I went back and used the f75 to isolate deeper signals, along with the pin-pointer, and recovered deeper coins. Pinpointing still was not perfect and I made a lot of use of the pin-pointer in locating the coins for retrieval. Many coins were at the limit that my index finger and the screwdriver could manipulate the coin to the surface. 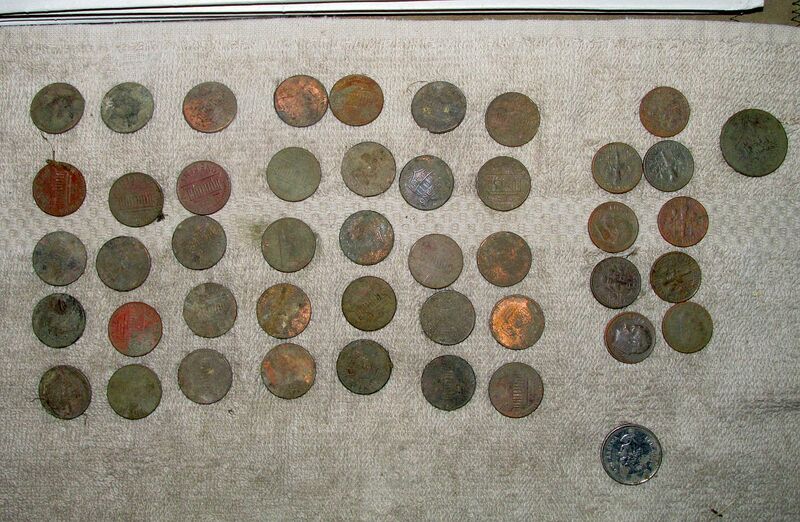 I was amazed at how many high conductor coins in that small area had been masked by the mostly badly corroded zincolns. Total coins for a one hour hunt (it was fully dark when I quit), 46 coins. One quarter, nine dimes, one Canadian nickle, and forty cent coins. Twelve of the cents were copper, and three of those had been dug before the test started. The nickle was on edge against the concrete holding up the meter head. Twenty three zincolns masked twenty higher conductor coins in the ground beneath them, including one quarter. So digging zinc is a pain. But it might be worth it. Note: the area is still not 100% clear. There are still some mid-tone signals to recover, and possibly more. I ran out of daylight. The whole hunt was barely an hour.